Originally uploaded by Diamond Joe. 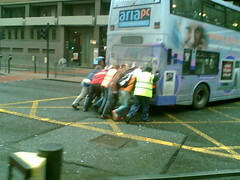 "This bus broke down at the only exit to Piccadilly bus station. After trying to restart for 20 minutes, they threw all the punters off the bus and collared a couple of passing students to give it a push."